The aim of this study was to evaluate the SBS and qualitative etching patterns of laser prepared enamel with different dental adhesives. The null hypothesis is that there are no differences between SBS values of different dental adhesives on Er:YAG laser prepared enamel. It was also hypothesized that there is no correlation between qualitative etching patterns of enamel and SBS values. A total of 75 sound bovine incisors were extracted for no longer than a month and kept in distilled water at 4΀C. After this period of time, teeth were kept in a 0.5% chloramine solution for a week and bisected with a microtomer (Accuton-Struers, Ballerup, Denmark) to separate the crown from the root. They were then polished with a 240-grit sandpaper to create a flat surface (Carbimet Buehler-met, Buehler, and Lake Bluff, Illinois. Enamel surface preparations were performed using an Er: YAG laser system (OpusDent™, Lumenis company, London, United Kingdom, model SA5601000, series number 005-13201), with a power of 500 mJ and a 12 Hz frequency. A working distance of one mm was used in a defocused mode. The specimens were divided in five groups (n0 = 15) according to the dental adhesive system used (Group I - PA + ExciTE® ; Group II - ExciTE® (without PA); Group III - AdheSE; Group IV - FuturaBond® NR; Group V - Xeno® V). All the specimens were laser treated immediately before the application of bonding, according to [Table 1]. After the application of the adhesive according to the manufacturer's instructions, composite resin cylinders were bonded to the tested surfaces (Synergy D6, A2/D2, Coltène Whaledent GmbH, Langenau, Germany), and specimens were kept in distilled water for 24 h at 37΀C with 100% humidity (Hemmet, Schwabach, Germany) in order to obtain the maximum resin polymerization, before being thermocycled (Aralab, mod 200E, Cascais, Portugal) for 500 cycles at 5΀C and 55΀C for 20 s  in each bath and submitted to shear testing at a crosshead speed of 0.5 mm/min (Instron, model 4502, series H3307, Instron Ltd, Bucks, England). A one-way ANOVA was run to determine, if there were differences among groups and Student knewman keuls post-hoc analysis to visualize between which groups these differences were detected and the confidence level was set to 95%. The fracture sites of the de-bonded surfaces were examined using a binocular stereomicroscope (Stereo Microscope Zoom-10, Nikon, Melville, New York, USA) at ×15. Representative samples were chosen for examination under Scanning Electron Microscope JEOL Ltd, JSM 6301F/Oxford Instruments Analytical INCA Energy 350/Gatan Alto 2500, Tokyo, Japan). Samples were mounted on SEM stubs and sputter-coated with gold. Examination was done a t 30 kV of accelerating voltage at different magnifications and characteristic photomicrographs were obtained at ×2000. Type V - Flat, smooth surfaces. According to the statistical analysis, SBS was affected by the type of bonding system used. SBS values were shown in Graph 1 [Additional file 1]. The mean bond strengths were Group I - 47.17 ± 1.61 MPa; Group II - 32.56 ± 1.64 MPa, Group III - 29.10 ± 1.34 MPa; Group IV - 23.32 ± 1.53 MPa; Group V - 24.43 ± 1.55 MPa. The values between Group II and Group III and Group IV and Group V were not significantly different (P0 > 0. 05). Group I was significantly higher than the rest of the groups (P < 0. 05). 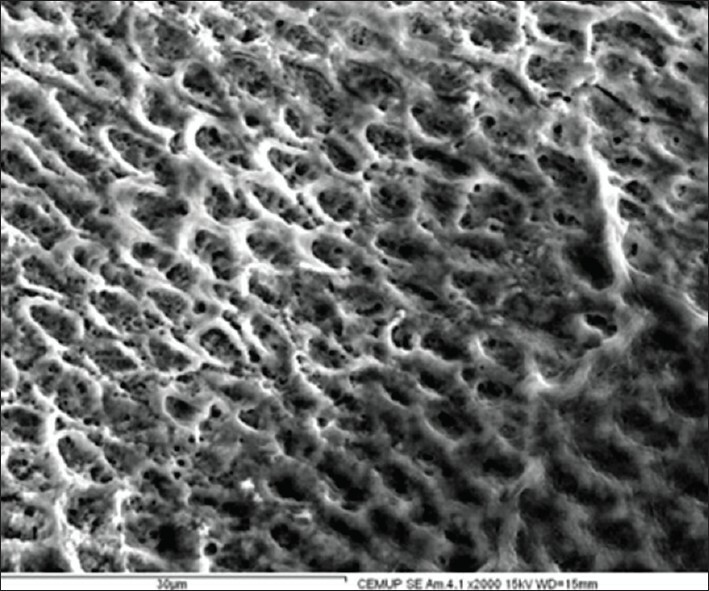 [Figure 1], [Figure 2], [Figure 3], [Figure 4], [Figure 5] show the enamel surface after laser irradiation and application of the different adhesive systems: 37% PA + ExciTE® (Group I); ExciTE® (Group II); AdheSE® (Group III); FuturaBond® (Group IV) and Xeno® V (Group V), respectively. Groups' II, III, and IV had similar patterns among them. The latter's enamel surface topography showed predominant dissolution of enamel peripheries with areas of prism core dissolution (a type III etching pattern). 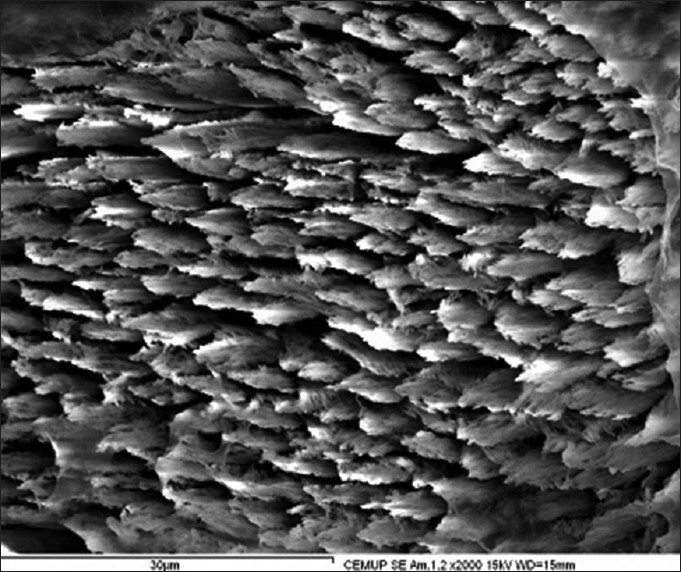 Although, Group V produced the enamel crystallite dissolution pattern similar to that produced with the other self-etch systems, the demineralization produced is less defined, shallower with a non-homogeneous type II etch pattern. With the use of PA (Group I) topography revealed a milder, homogeneous Type I etching pattern. The enamel prisms were hollowed out to deep pits or craters placed side by side separated by thick inter-prismatic enamel persisting in the form of rings. 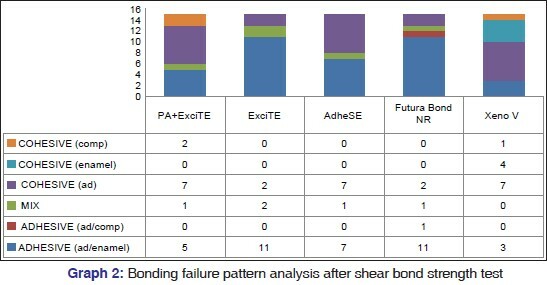 Graph 2 [Additional file 2] shows the bonding failure pattern analysis after SBS test. Bonding to enamel is primarily based on the micromechanical interlocking of a low-viscosity resin, which penetrates into enamel micro-porosities. Considering this, apart from the mechanical properties of the adhesive itself, the surface morphology, that is, the extent, depth and etching pattern should influence the performance of the evaluated adhesive. Therefore, we think it is important to understand how these surface alterations are performed on enamel and how it responds to different conditioning materials and methods. For groups GII and GIV, adhesive failures were more frequent. The increase in adhesive failures observed when ExciTE was used without PA and when SE systems were also used may be explained by the reduced etching effect of the SE systems on the enamel surface, thus, reducing surface area available for adhesion. Only Xeno® V doesn't fit in the explanation, which may be due to its unique chemical composition. Further investigations are necessary to understand this discrepancy. The null hypothesis that SBS values are not affected when enamel is prepared with Er:YAG laser was rejected. It was also hypothesized that etching patterns of enamel have no correlation effects with the values of SBS. This hypothesis was confirmed. Despite similar etching patterns for some groups (GII, GIII, GIV), SBS values were different for the adhesives present in the study. Further in vitro research should be performed to evaluate the long-term bond strength (water storage) of restorations bonded to substrates subjected to laser treatment and in vivo research should assess their clinical longevity. Based on a thesis submitted to the Dental Medicine, faculty of University of Porto, in partial fulfilment of the requirements for the Doctor degree. 1. Holzmeier M, Schaubmayr M, Dasch W, Hirschfelder U. A new generation of self-etching adhesives: Comparison with traditional acid etch technique. J Orofac Orthop 2008;69:78-93. 2. Erickson RL, Barkmeier WW, Kimmes NS. Bond strength of self-etch adhesives to pre-etched enamel. Dent Mater 2009;25:1187-94. 3. Goracci C, Bertelli E, Ferrari M. Bonding to worn or fractured incisal edges: Shear bond strength of new adhesive systems. Quintessence Int 2004;35:21-7. 4. Loguercio AD, Moura SK, Pellizzaro A, Dal-Bianco K, Patzlaff RT, Grande RH, et al. Durability of enamel bonding using two-step self-etch systems on ground and unground enamel. Oper Dent 2008;33:79-88. 5. Perdigão J, Gomes G, Duarte S Jr, Lopes MM. 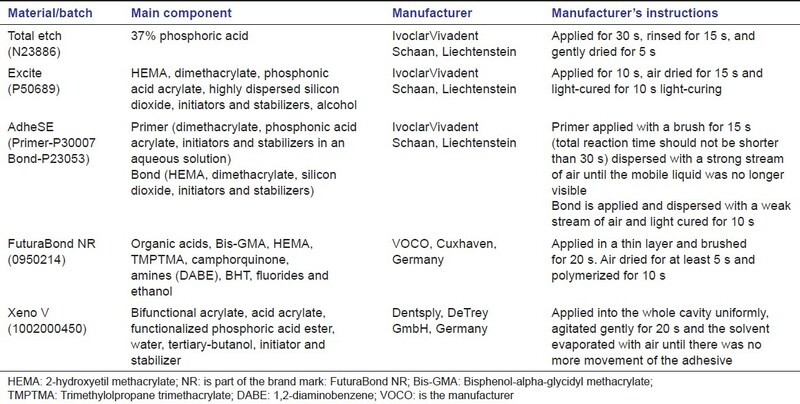 Enamel bond strengths of pairs of adhesives from the same manufacturer. Oper Dent 2005;30:492-9. 6. Peumans M, Munck J, Van Landuyt K, Lambrechts P, Van Meerbeek B. Three-year clinical effectiveness of a two-step self-etch adhesive in cervical lesions. Eur J Oral Sci 2005;113:512-8. 7. Benetti P, Fernandes VV, Torres CR, Pagani C. Bonding efficacy of new self-etching, self-adhesive dual-curing resin cements to dental enamel. J Adhes Dent 2011;13:231-4. 8. Lima AF, da Silva VB, Soares GP, Marchi GM, Baggio Aguiar FH, Lovadino JR. Influence of previous acid etching on interface morphology and bond strength of self-etching adhesive to cavosurface enamel. Eur J Dent 2012;6:56-62. 9. Watanabe T, Tsubota K, Takamizawa T, Kurokawa H, Rikuta A, Ando S, et al. Effect of prior acid etching on bonding durability of single-step adhesives. Oper Dent 2008;33:426-33. 10. Chimello-Sousa DT, de Souza AE, Chinelatti MA, Pécora JD, Palma-Dibb RG, Milori Corona SA. Influence of Er:YAG laser irradiation distance on the bond strength of a restorative system to enamel. J Dent 2006;34:245-51. 11. Goswami M, Singh A. Comparative evaluation of shear bond strength of composite resin bonded to acid etched or Nd: Yag lased enamel. J Indian Soc Pedod Prev Dent 2011;29:140-3. 12. Obeidi A, Liu PR, Ramp LC, Beck P, Gutknecht N. Acid-etch interval and shear bond strength of Er, Cr: YSGG laser-prepared enamel and dentin. Lasers Med Sci 2010;25:363-9. 13. Shahabi S, Bagheri HG, Ramazani K. Tensile bond strength of sealants following Er:YAG laser etching compared to acid etching in permanent teeth. Lasers Med Sci 2012;27:371-5. 14. Amaral FL, Colucci V, Souza-Gabriel AE, Chinelatti MA, Palma-Dibb RG, Corona SA. Bond durability in erbium: Yttrium-aluminum-garnet laser-irradiated enamel. Lasers Med Sci 2010;25:155-63. 15. Carrieri TC, de Freitas PM, Navarro RS, Eduardo Cde P, Mori M. Adhesion of composite luting cement to Er:YAG-laser-treated dentin. Lasers Med Sci 2007;22:165-70. 16. Obeidi A, McCracken MS, Liu PR, Litaker MS, Beck P, Rahemtulla F. Enhancement of bonding to enamel and dentin prepared by Er, Cr: YSGG laser. Lasers Surg Med 2009;41:454-62. 17. Dunn WJ, Davis JT, Bush AC. Shear bond strength and SEM evaluation of composite bonded to Er:YAG laser-prepared dentin and enamel. Dent Mater 2005;21:616-24. 18. De Munck J, Van Meerbeek B, Yudhira R, Lambrechts P, Vanherle G. Micro-tensile bond strength of two adhesives to Erbium: YAG-lased vs. bur-cut enamel and dentin. Eur J Oral Sci 2002;110:322-9. 19. Moldes VL, Capp CI, Navarro RS, Matos AB, Youssef MN, Cassoni A. In vitro microleakage of composite restorations prepared by Er:YAG/Er, Cr: YSGG lasers and conventional drills associated with two adhesive systems. J Adhes Dent 2009;11:221-9. 20. Leonetti Edos S, Rodrigues JA, Reis AF, Navarro RS, Aranha AC, Cassoni A. Effects of Er:YAG laser irradiation on the microtensile bond strength to bleached enamel. Photomed Laser Surg 2011;29:551-8. 21. Sheets JL, Wilcox CW, Barkmeier WW, Nunn ME. The effect of phosphoric acid pre-etching and thermocycling on self-etching adhesive enamel bonding. J Prosthet Dent 2012;107:102-8. 22. Silverstone LM, Saxton CA, Dogon IL, Fejerskov O. 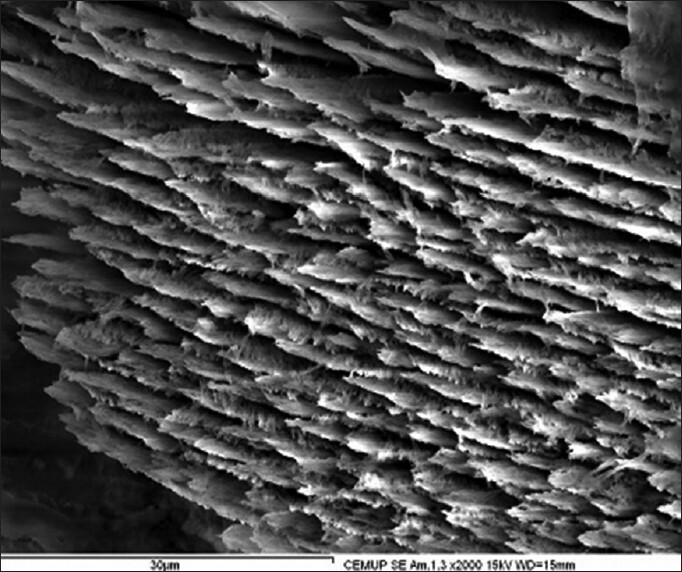 Variation in the pattern of acid etching of human dental enamel examined by scanning electron microscopy. Caries Res 1975;9:373-87. 23. Ibrahim IM, Elkassas DW, Yousry MM. Effect of EDTA and phosphoric Acid pretreatment on the bonding effectiveness of self-etch adhesives to ground enamel. Eur J Dent 2010;4:418-28. 24. Karaarslan ES, Usumez A, Ozturk B, Cebe MA. Effect of cavity preparation techniques and different preheating procedures on microleakage of class V resin restorations. Eur J Dent 2012;6:87-94. 25. Ozer T, Baºaran G, Berk N. Laser etching of enamel for orthodontic bonding. Am J Orthod Dentofacial Orthop 2008;134:193-7. 26. Sasaki LH, Lobo PD, Moriyama Y, Watanabe IS, Villaverde AB, Tanaka CS, et al. Tensile bond strength and SEM analysis of enamel etched with Er:YAG laser and phosphoric acid: A comparative study in vitro. Braz Dent J 2008;19:57-61. 27. Sancakli HS, Erdemir U, Yildiz E. Effects of Er:YAG laser and air abrasion on the microleakage of a resin-based fissure sealant material. Photomed Laser Surg 2011;29:485-92. 28. Youssef MN, Youssef FA, Souza-Zaroni WC, Turbino ML, Vieira MM. Effect of enamel preparation method on in vitro marginal microleakage of a flowable composite used as pit and fissure sealant. Int J Paediatr Dent 2006;16:342-7. 29. Baºaran EG, Ayna E, Baºaran G, Beydemir K. Influence of different power outputs of erbium, chromium: Yttrium-scandium-gallium-garnet laser and acid etching on shear bond strengths of a dual-cure resin cement to enamel. Lasers Med Sci 2011;26:13-9. 30. Basaran G, Ozer T, Berk N, Hamamci O. Etching enamel for orthodontics with an erbium, chromium: Yttrium-scandium-gallium-garnet laser system. Angle Orthod 2007;77:117-23. 31. Cardoso MV, De Munck J, Coutinho E, Ermis RB, Van Landuyt K, de Carvalho RC, et al. Influence of Er, Cr: YSGG laser treatment on microtensile bond strength of adhesives to enamel. Oper Dent 2008;33:448-55. 32. Andrade AM, Moura SK, Reis A, Loguercio AD, Garcia EJ, Grande RH. Evaluating resin-enamel bonds by microshear and microtensile bond strength tests: Effects of composite resin. J Appl Oral Sci 2010;18:591-8. 33. Borges MA, Matos IC, Dias KR. Influence of two self-etching primer systems on enamel adhesion. Braz Dent J 2007;18:113-8. 34. Mine A, De Munck J, Vivan Cardoso M, Van Landuyt KL, Poitevin A, Kuboki T, et al. Enamel-smear compromises bonding by mild self-etch adhesives. J Dent Res 2010;89:1505-9. 35. Dias WR, Pereira PN, Swift EJ Jr. Effect of surface preparation on microtensile bond strength of three adhesive systems to bovine enamel. J Adhes Dent 2004;6:279-85. 36. Martínez-Insua A, Da Silva Dominguez L, Rivera FG, Santana-Penín UA. Differences in bonding to acid-etched or Er:YAG-laser-treated enamel and dentin surfaces. J Prosthet Dent 2000;84:280-8. 37. Hossain M, Yamada Y, Nakamura Y, Murakami Y, Tamaki Y, Matsumoto K. A study on surface roughness and microleakage test in cavities prepared by Er:YAG laser irradiation and etched bur cavities. Lasers Med Sci 2003;18:25-31. 38. Bowen RL, Nemoto K, Rapson JE. 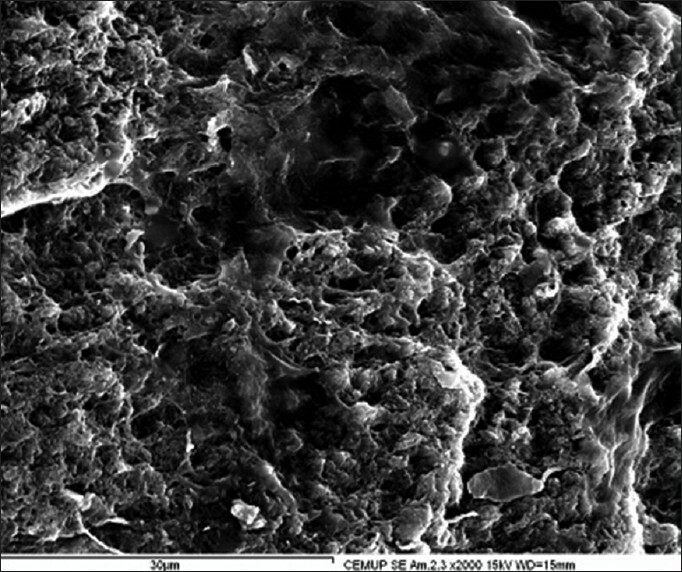 Adhesive bonding of various materials to hard tooth tissues: Forces developing in composite materials during hardening. J Am Dent Assoc 1983;106:475-7. 39. Baºaran G, Hamamcý N, Akkurt A. Shear bond strength of bonding to enamel with different laser irradiation distances. Lasers Med Sci 2011;26:149-56. 40. Tay FR, Pashley DH, Hiraishi N, Imazato S, Rueggeberg FA, Salz U, et al. Tubular occlusion prevents water-treeing and through-and-through fluid movement in a single-bottle, one-step self-etch adhesive model. J Dent Res 2005;84:891-6. 41. Perdigão J, Gomes G, Lopes MM. Influence of conditioning time on enamel adhesion. Quintessence Int 2006;37:35-41. 42. Moszner N, Salz U, Zimmermann J. Chemical aspects of self-etching enamel-dentin adhesives: A systematic review. Dent Mater 2005;21:895-910. 43. Ibarra G, Vargas MA, Armstrong SR, Cobbb DS. Microtensile bond strength of self-etching adhesives to ground and unground enamel. J Adhes Dent 2002;4:115-24. 44. Brackett WW, Tay FR, Looney SW, Ito S, Haisch LD, Pashley DH. 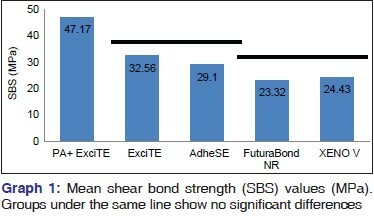 Microtensile dentin and enamel bond strengths of recent self-etching resins. Oper Dent 2008;33:89-95. 45. Tsujimoto A, Iwasa M, Shimamura Y, Murayama R, Takamizawa T, Miyazaki M. Enamel bonding of single-step self-etch adhesives: Influence of surface energy characteristics. J Dent 2010;38:123-30. 46. Salz U, Bock T. Adhesion performance of new hydrolytically stable one-component self-etching enamel/dentin adhesives. J Adhes Dent 2010;12:7-10. 47. Van Landuyt KL, Mine A, De Munck J, Jaecques S, Peumans M, Lambrechts P, et al. Are one-step adhesives easier to use and better performing? Multifactorial assessment of contemporary one-step self-etching adhesives. J Adhes Dent 2009;11:175-90. 48. Souza-Zaroni WC, Chinelatti MA, Delfino CS, Pécora JD, Palma-Dibb RG, Corona SA. 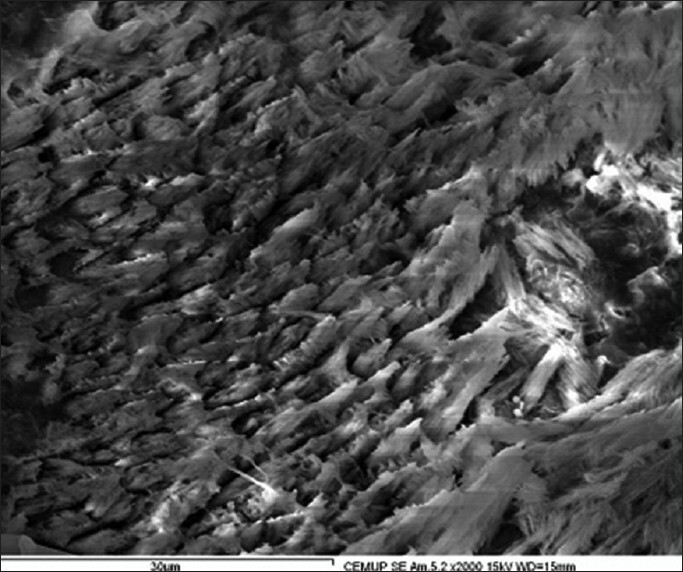 Adhesion of a self-etching system to dental substrate prepared by Er:YAG laser or air abrasion. J Biomed Mater Res B Appl Biomater 2008;86:321-9. 49. Van Meerbeek B, Yoshihara K, Yoshida Y, Mine A, De Munck J, Van Landuyt KL. State of the art of self-etch adhesives. Dent Mater 2011;27:17-28. 50. De Moor RJ, Delme KI. Laser-assisted cavity preparation and adhesion to erbium-lased tooth structure: Part 2. present-day adhesion to erbium-lased tooth structure in permanent teeth. J Adhes Dent 2010;12:91-102. 51. Wiegand A, Stawarczyk B, Kolakovic M, Hämmerle CH, Attin T, Schmidlin PR. Adhesive performance of a caries infiltrant on sound and demineralised enamel. J Dent 2011;39:117-21.